Newgrounds.com — Everything, By Everyone. Kong Punt 25 Points 01 - Punt Donkey Kong Jr.
Bloodsport 5 Points Secret Medal: Unlock this medal to view its details! Jason Lives 5 Points Secret Medal: Unlock this medal to view its details! No Filming 5 Points Secret Medal: Unlock this medal to view its details! Surf's Up 5 Points Secret Medal: Unlock this medal to view its details! Duck Hunted 10 Points Secret Medal: Unlock this medal to view its details! Friendly Foes 10 Points Secret Medal: Unlock this medal to view its details! Headbanger 10 Points Secret Medal: Unlock this medal to view its details! Luckdragon 10 Points Secret Medal: Unlock this medal to view its details! Sneaky 10 Points Secret Medal: Unlock this medal to view its details! Thanks Doc 10 Points Secret Medal: Unlock this medal to view its details! Another Castle 25 Points Secret Medal: Unlock this medal to view its details! Bobo Battle 25 Points Secret Medal: Unlock this medal to view its details! Double Trouble 25 Points Secret Medal: Unlock this medal to view its details! Fire Bad! 25 Points Secret Medal: Unlock this medal to view its details! Kill The Messenger 25 Points Secret Medal: Unlock this medal to view its details! Best Ending Evar 50 Points Secret Medal: Unlock this medal to view its details! Private Party 50 Points Secret Medal: Unlock this medal to view its details! Thriller 50 Points Secret Medal: Unlock this medal to view its details! 10 Points Destroy the cat's mobile fortress. Battle Cat 10 Points Bring NoLegs to the battlefield. Giga Golem 10 Points Master the elements. Guardian 10 Points Smash up an elite sentry. Invincible 10 Points Survive with 1HP remaining. Max Radiation 10 Points Fire the Ion Cannon for the first time. Minigamer 1 10 Points Get 5000 points in part one. Minigamer 2 10 Points Get 6000 points in part two. Noob 10 Points Kill yourself. Oblivion 10 Points Swept away by waves of fire. Sand Worm 10 Points Eat worms for breakfast. Zombie Hydra 10 Points Slay the undead dragon. Middle Tier 25 Points Beat the game on Normal Difficulty. Minigamer 3 25 Points Get 10,000 points in survival. Sword Master 25 Points Try out all swords. Beast Master 50 Points Complete the bestiary by scanning all foes. Leet Tier 50 Points Beat the game on Hard Difficulty. Overkill 50 Points Hit the damage limit of 99999. Valkyrie 50 Points Defeat the final boss and save the world. God Tier 100 Points Beat the game on Epic Difficulty. 5 Points Complete the tutorial to begin your journey. Lost and Found 10 Points Find all the lost items. Modular Design 10 Points Pimp out your ride with all possible modules. Upgrade Started 10 Points Upgrade one of your sub-systems. Midpoint 25 Points Complete 10 Objectives. Unearth 25 Points Uncover all the buried items. Game Complete 50 Points Find all the Alien artifacts to complete the 'story'. Upgrade Complete 100 Points Upgrade all sub-systems to their maximum levels. 5 Points Make Gretel walk for the first time. Birdie 5 Points Secret Medal: Unlock this medal to view its details! Headless 5 Points Secret Medal: Unlock this medal to view its details! Liberal Animation 5 Points Secret Medal: Unlock this medal to view its details! Sorceress 5 Points Secret Medal: Unlock this medal to view its details! Your Head Essplode! 5 Points Secret Medal: Unlock this medal to view its details! Holy Shhhhhh 10 Points Secret Medal: Unlock this medal to view its details! 5 Points Grab the bag! 25 Points You call that a kiss? Alliance 10 Points Form an alliance. 5 Points Kill 10 enemies. maniac 50 Points Secret Medal: Unlock this medal to view its details! sniper 100 Points Secret Medal: Unlock this medal to view its details! 5 Points touch enemy or spike... not sooo clever! 10 Points kill the first enemy! 25 Points That's the way things work! 25 Points mastered the first floor! 50 Points found a gun! 100 Points kill the Evil End Boss! 100 Points maximum level experience! Cash King 100 Points Secret Medal: Unlock this medal to view its details! 5 Points Secret Medal: Unlock this medal to view its details! Humanity 10 Points THE journey ends. YOUR journey begins. ChrisPalmerX	Writing Collage Spring Break - UPDATE! ganassa-artwork	DMC Lady NSFW Fan art Reward uploaded! 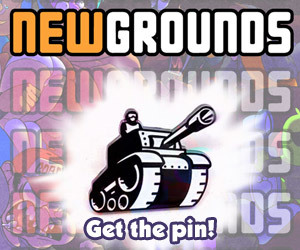 newgrounds.com — Your #1 online entertainment & artist community! All your base are belong to us.